Just over a week ago the City of Melbourne released the first two discussion papers as part of its Transport Strategy Refresh. These focused on the themes of 'Walking' and 'City Space' with Urban Melbourne providing commentary via this article and during Episode 10 of the Weekly podcast. 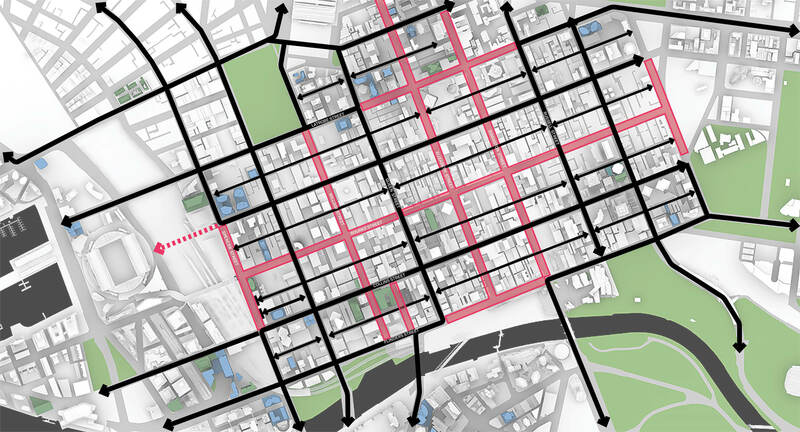 The ambitious plan will look to examples from abroad such as Barcelona's proposed "superblock" strategy which creates a series of small neighbourhoods around which traffic will circulate around the perimeter, and in which road space within the interior will be re-purposed into shared public spaces. The Superblock strategy will commence with the famous gridded neighbourhood of Eixample where a superblock will comprise nine existing blocks of the grid, in a 3 x 3 formation. Vehicular traffic will then be restricted to just the roads bounding the superblock, and they will only be allowed in the streets in between if they are residents or providing local businesses, and at a greatly reduced speed of 10km/h. 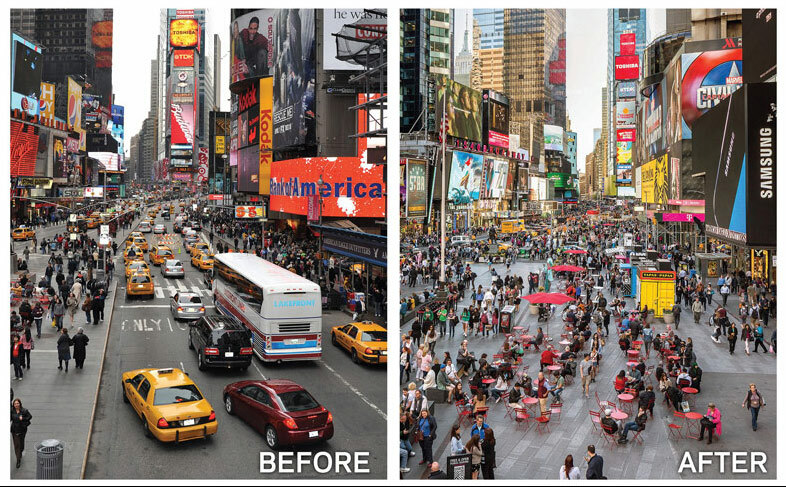 The NYC Department of Transport's (DOT) “Green Light for Midtown” pilot project in 2009 paved the way (pun intended) for the Times Square Reconstruction project, enabling temporary paving and street furniture to close Broadway to vehicular traffic between 42nd and 47th Streets. This initiative originally intended to improve safety and alleviate traffic conditions but the pilot project's success led to NYC DOT permanently reconsidering the function and layout of Times Square via a three-pronged approach that would upgrade critical utility infrastructure, provide event infrastructure for new and expanded public events, and permanently adopt the temporary improvements that were piloted in 2009. London too is getting in on the action with plans to pedestrianise large parts of Oxford Street announced last November, with a target date of the end of this year. The plan aims to improve air quality and congestion in the city and is the first of three phases which will transform Oxford Street, to be followed by the stretch between Oxford Circus and Tottenham Court Road and then between Marble Arch and Orchard Street. All east-west traffic will be stopped but some north-south routes will be maintained, according to the plans. More than four million people visit Oxford Street each week. In Melbourne, the largest barrier is changing people's attitudes and reliance on travelling into the city via private vehicle. Part of addressing this lies in providing an efficient and reliable public transport system which offers an alternative to the car. Likewise providing safe and walkable city streets which encourage people to walk short distances and dedicated bicycle lanes for cyclists is critical to ensuring a quality public realm. Melbourne Metro will go some way to addressing some of the issues, however significant bottlenecks exist for pedestrians in and around Southern Cross Station and Flinders Street Station, in morning and evening peak, which is exacerbated when events are on at Etihad Stadium or within Fed Square. The recently announced redevelopment of Etihad Stadium and the delivery of the Melbourne Airport Rail Link (MARL) in the next 5-10 years and potential for Metro 2.0 to converge at Southern Cross Station will further reinforce its role as a key interchange node and so providing a safe environment surrounding the station is critical. However this doesn't necessarily alleviate the problems described above relating to pedestrian congestion at Flinders Street and Southern Cross Stations and conflict between pedestrians and cars. Fundamental to this is understanding and defining the roles and hierarchies of the streets - what is their purpose and how best to manage access and movement for delivery, emergency services, taxis and people with impaired mobility? Limiting north-south vehicular movement as much as possible allows for improved and safer interchange between heavy and light rail at the city's stations and more pedestrian-focused streets adjacent to the stations. Additionally, this would create more pedestrian streets with good solar access during the middle of the day. With the CBD short on open space and site acquisition to provide open space costly, the street network offers a potential solution. 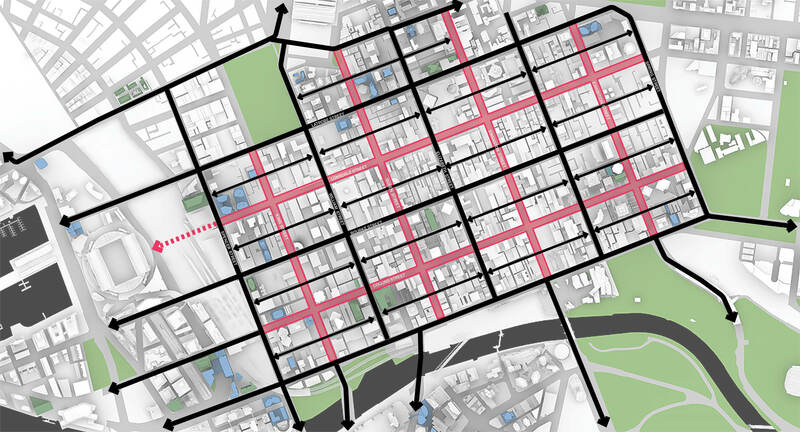 A variation of the "Superblock" with pedestrian zones adjacent to stations. The 'little' streets would serve the purpose of providing servicing and resident vehicle access, with movements primarily occurring in the east-west direction. I would also suggest pedestrianising St Kilda Rd as far as City Rd, but that may be a bridge too far.